The Highland Arts Council actively promotes the Arts in and around the community of Highland, through a variety of activities and projects. for many members of the community to be exposed to the Arts. providing educational opportunities involved with the Arts. young and old, new and creative ways to showcase their art. Feel - and share with others - the exhilaration of the Arts by becoming a member of the Highland Arts Council today! Held in October, Art in the Park is an outdoor exhibition of works by nearly 70 professional artists at Lindendale Park in Highland, Illinois. 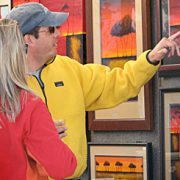 Artists from throughout the country display fine arts in a variety of media. Highland community's highlights during the year. sponsor and display artwork throughout the community of Highland. Pop Pop's Custard and Coffee. Brady Kesner and Lynnette Schuepbach of the HAC are shown with a mural created at Art in the Park 2010. 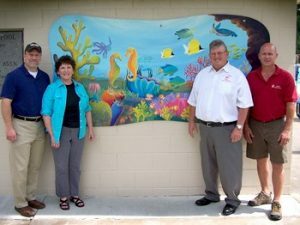 Highland Mayor Joe Michaelis and Director of Parks and Recreation, Mark Rosen joined them as the murtal was installed for all to see on the Highland Community Pool building. » Create a forum for people who share a love and interest in the Arts. » Promote local appreciation for the ARTS through community events that create enthusiasm and add cultural value. » Provide a venue for the appreciation and exposure of local artists. » Encourage community access to professional artists and a variety of art forms. 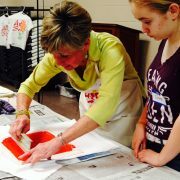 » Foster and promote community youth involvement in the Arts. Everyone who has a passion for the arts and the desire to join a wonderful community organization is welcome in the Highland Arts Council! You may join as a Student, Individual, Family, Corporation, or Lifetime. Whatever your situation, you will be surrounded by friends who also love the Arts. We have a lot of fun and we work hard to promote the Arts in the Highland community. 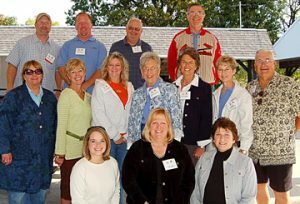 We have long time members and we have new members. We welcome those who have lots to contribute and we we welcome those who can only contribute a little. Either way, the Arts Council can be whatever you choose to make it and we're glad to have you... consider becoming a member today! The monthly meetings of the Highland Arts Council are held the first Monday of the month, 6:30 p.m. Come join us! If you prefer not to register online, but would like to join, download a Membership Application! Membership meetings are scheduled for the first Monday of each month at 6:30 pm at 1312 Broadway, Highland, Illinois 62249. You are invited to attend, but are NOT required to attend as a member. If you choose to help with any of our programs, send an email to HAC membership chair. Click here. Art of Soul is a five-week session that meets on Thursday evenings from 7 pm - 9 pm at the Evangelical United Church of Christ to experiment with five different mediums. It began in 2013 partially funded by a grant from the Highland Area Community Foundation. HAC has presented mediums such as watercolors, polymer clay, ceramics, pastels, acrylic painting, origami, felting, and alcohol inks on tiles. You can expect to see many new things each year. 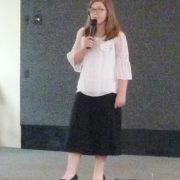 HAC has been excited to see representation from 22 surrounding communities with 50 - 70 people attending each year. Learn more.. The streets around Highland's Square become a canvas on a weekend in September. 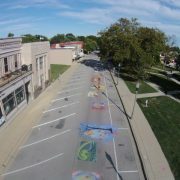 Artists turn the streets into works of art using chalk and the event has become on of the most unique art events in the area. The HAC helps to sponsor the Street Art Fest and also organizes an Art Expo where local artists showcase their work during the event. | See the Street Art Fest Web Pages. HAC highlights the music, drama, and visual arts presented by youth from middle schools and high schools from Highland Community Schools and surrounding schools. It's an opportunity to show the creativity and brilliance of our young people.